The founder of 38 Studios says "devastating" comments by the Governor of Rhode Island were a big factor in the company's collapse. Curt Schilling, the former Red Sox ace who founded 38 Studios in 2006, hasn't had much to say about its rapid spiral downward over the past month. He's kept quiet so far in order to avoid upsetting "sensitive" efforts to save the company, but now he's speaking out, and he doesn't have many good things to say about his erstwhile business partner. "The Governor is not operating in the best interest of the company by any stretch, or the taxpayers, or the state," Schilling told the Providence Journal. "We're trying to save this company and we're working 24/7. The public commentary has been as big a piece of what's happening to us as anything out there." In response to a statement from Rhode Island Governor Lincoln Chafee that the state will not give 38 Studios any more money in order to keep it afloat, he added, "That money is going into the hands, wallets, mouths of families who live in Rhode Island - right back into the system... We're not trying to take advantage of the taxpayers. We're trying to be a successful business in the State of Rhode Island that helps the State of Rhode Island get out of the doldrums that we are in." 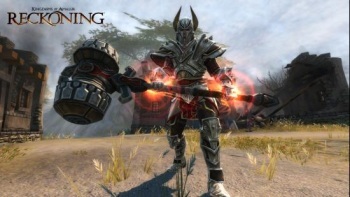 Schilling explained that while the studio's debut release, Kingdoms of Amalur: Reckoning, was a solid success, the money went directly to Electronic Arts, which had already paid an up-front $35 million "publishing fee" for the game. When 38 Studios' money troubles first arose in mid-April, negotiations for further support, including $8.7 million in tax credits, appeared to be going well, until the state allegedly began playing games. That, combined with public statements from Chafee about the company's solvency issues, burn rate and other matters scared off private investors who were poised to get behind both the "Project Copernicus" MMO and the Kingdoms of Amalur sequel. The studio isn't dead and buried just yet, as 38 Studio executives are continuing to seek investors to resuscitate the company. It also continues to pursue tax credits the state recently suggested it may be ineligible to receive. On a more personal level, Schilling says that perceptions of him as a rich guy taking government hand-outs are completely off-base; he's personally got $50 million wrapped up in the company, and stands to lose it all if it goes under.